September is here! And with it we launch into the season of fall marketing, and soon to be holiday marketing. September is the perfect time to put your marketing plans in place for the rest of the year. When you have a strong marketing strategy, you can reach more potential customers, have better engagement with clients and even keep current customers continually interacting with the business. So, how can you kick off your September marketing? 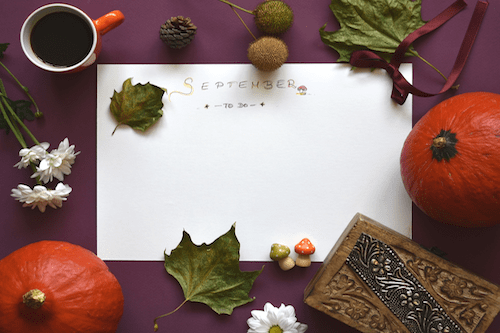 Here are seven super September marketing ideas for you to jump start your marketing this month and head into the season. It’s back-to-school season! Even though some schools might already be in session, you can still catch the end of the marketing wave by sharing back-to-school marketing tactics with potential consumers. Share how your products or services can be used as students head back to school after summer ends. There are lots of fun monthly events going on in the month of September. For instance, did you know September is Hispanic Heritage Month? Or National Piano Month? Or Self Improvement Month? Check online for a list of national monthly events during September, then build a marketing strategy around one. Not only is September home to Labor Day, but there are also plenty of silly holidays to celebrate and market during this month. National Fortune Cookie Day is September 13th, National Cheeseburger Day is September 18th and International Rabbit Day is September 22nd. Research silly holidays to see which ones can fit with your brand and marketing. Of course, one of the most popular reasons for the season: football! Football is here, which means it’s the perfect opportunity to engage with your consumer base and market through the sport they love. See how you can integrate the football theme into your marketing strategy and connect with customers. As summer cools down, fall is just around the corner, which means fall decor should be a staple in your marketing strategy. Whether you decorate your brick and mortar business with fall decor, spice up your social media with cool autumn colors or share a fall special, fall is a fantastic season to market to potential and current clients. September can be a big time for change in people’s lives, but that doesn’t mean they have to change your business. Keep customers coming back with a customer loyalty program. Share the program through your marketing strategy and keep current customers engaged, inspired and happy to support your business. Finally, with its beautiful colors, fresh breeze and fun holidays, September is a great time to upgrade your social media marketing strategy. If you haven’t integrated social media into your marketing, now is a great time to do so. Engage with customers exactly where they’re at by creating accounts on various social media platforms, then sharing your mission, brand and products with followers. If you want to up your marketing game, September is the perfect time to do so. As we head into the fall season, be sure to take advantage of these seven super marketing ideas this month. Not only can you improve your marketing plan, but you can better connect with customers and help grow your business.